Filled with various entertainment centers and the general excitement that evening brings, Chiang Mai's night life is another attraction that draws many domestic and international tourists. For browsers, Chiang Mai is a world of colors and variety. The section of ChangKlan Road known as the Night Bazaar is almost always saturated with night time shoppers. An interesting dining option on the Night Bazaar is Galare Food Center - which opens from about six in the evening to midnight. You can find there almost any kind of Northern and Thai food ranging from noodles to sweet desserts - among a pleasant atmosphere of local music and cultural shows. For evening entertainement, Chiang Mai provides many options. For a peaceful, private evening, you can relax to piano music in a hotel lobby. Blues, Jazz, Rock, and both Thai and Western Country are played live at the many pubs and coffee shops around the city. In addition, there are several restaurants open at night, which along with serving food and drinks, also provide music, sometimes live, to help make your evening more enjoyable. And for a peppy atmosphere, try moving to the beat at a discotheque. 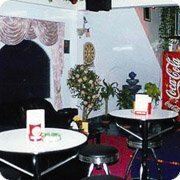 Most of the beer bars are located near the Thapae Gate wall, especially in the Bar Beer Centre on Moonmuang Road opposite Spotlight a go-go. These beer bars are just like what you get in Pattaya and Bangkok. Lots of little bars both scattered around and leading to the beer bar centre. There is occasionally some Muay Thai action to liven things up. Also in the Thapae Gate area is Spotlight A-Go-Go on Kotchasarn Road, and also Cosy Corner and John's Place on the other side of the moat on Moon Muang Road. These three a-go-gos - located south of the Thapae Gate wall, merely a few minutes walk from there - can compare favourably with some of the smaller go-gos in Bangkok. There are some beer bars in the Night Bazaar area. Also known as Chiang Mai Entertainment Plaza. There you will find about 15 outdoor bars around a Thai boxing ring. At night, they hold kick boxing matches along with other shows.